A&W Root Beer. The Burger Family. Chubby Chicken - a powerful lineup of great food and beverages and established brands. With over 960 restaurants in Canada, industry-leading growth, and 2018 system sales over $1.4 Billion, A&W Food Services of Canada Inc. is focused on being loved for our natural ingredients, great taste, convenience, and for doing what's right, making A&W the #1 choice for millennial burger lovers. Learn more about the fund. 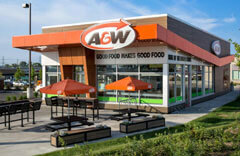 The A&W Revenue Royalties Income Fund is listed on the Toronto Stock Exchange (TSE: AW.UN). Are you interested in franchising? Visit the A&W franchise site.